MIAMI — Bill Hudson, an Associated Press photographer whose searing images of the civil rights era documented police brutality and galvanized the public, died Thursday in Jacksonville, Fla. He was 77. Mr. Hudson was in Birmingham, Ala., when black demonstrators defied a city ban on protests in 1963 and police turned their dogs on marchers, and again in Selma, Ala., when fire hoses were officers’ weapon of choice. 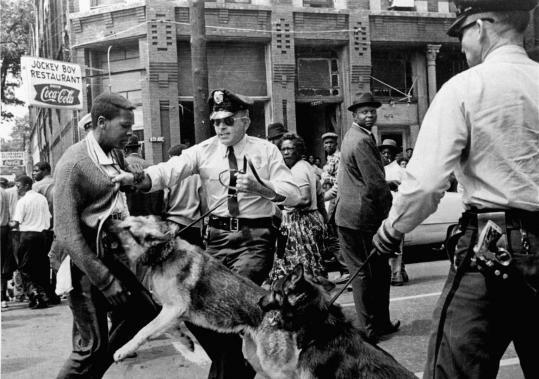 Most enduring of Mr. Hudson’s portfolio is a May 3, 1963, image of an officer in dark sunglasses grabbing a black youth by his sweater as he lets a police dog bury its teeth into the youth’s stomach. The youth, Walter Gadsden, has his eyes lowered, with a look of passive calm. Mr. Hudson died at Baptist Medical Center Beaches of congestive heart failure, his wife, the former Patricia Gantert, confirmed. He lived with his wife in Ponte Vedra, Fla. In more than three decades of photojournalism, Mr. Hudson chronicled the Korean War as an Army photographer and bodies destined for autopsies at the Dade County Medical Examiner. But his most profound work came in his coverage of the civil rights movement in the 1960s. The AP photograph of the police dog and the youth appeared above the fold in The New York Times the next day, across three columns, and in numerous other papers. Many came to see it as a force in galvanizing public opinion on behalf of the civil rights advocates. Mr. Hudson’s wife said her husband encountered a great deal of animosity from those who did not want him documenting the fights. Phil Sandlin, who documented the civil rights movement for United Press International before joining AP, said Mr. Hudson looked out for him despite working for a competitor. Mr. Hudson was born in Detroit and began his photographic career in the Army in 1949. He later shot photos for the Press-Register of Mobile, Ala., and the Chattanooga Times before joining AP in Memphis in 1962. He left in 1974, joining UPI. Besides his wife, Mr. Hudson leaves a sister, Sharon Garrison of Laguna Beach, Calif.